In theory, Karate is about fighting and was developed during a time when mortal combat was a way of life. 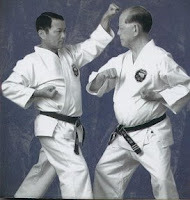 Today, a Karate-Ka should be able to take his or her knowledge outside the dojo and apply it to aspects of life that seemingly have nothing to do with the discpline and rigors of traditional Karate training. Training in Karate is demanding both physically and mentally, which explains why so many people drop-out of instruction early on. However, when we can achieve something through patience and practice and overcome its obstacles, we become a better, happier and more fulfilled person. That is the ultimate goal of Karate.